Athletes and sports fans that visited the Notre Dame Stadium last Friday may have noticed a change in lighting. 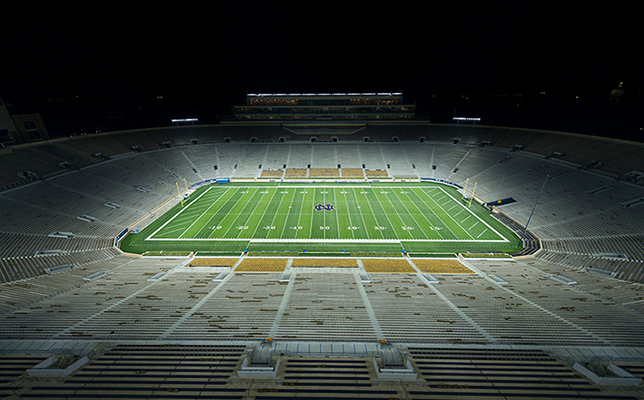 The University of Notre Dame (IN) debuted an energy-efficient LED system from its longtime partner Musco Lighting that provides an enhanced visual experience and significant energy cost savings. Musco’s SportsCluster Green LED system “produces a stage-like atmosphere for players and fans,” according to a prepared statement. 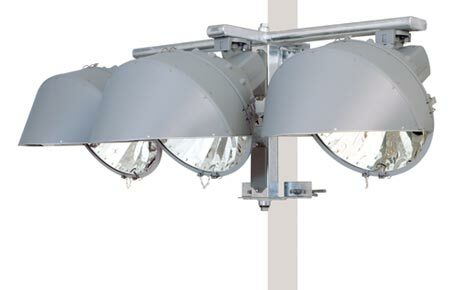 The system offers precise light control with customized optics that direct light onto the field and minimize glare. In addition, it reduces energy consumption by 57 percent (compared to the previous lighting system). The SportsCluster Green LED system (above). Source: Musco Lighting. A 10-year parts and labor warranty, as well as technical support. “We are impressed with the performance, efficiency and controllability of this new system and look forward to the benefits it will provide for decades to come," said Paul Kempf, senior director of utilities and maintenance at Notre Dame, in a statement. The university’s partnership with Musco began more than 30 years ago, when the company introduced its mobile lighting system in 1982. Since then, Musco has installed lighting at Purcell Pavilion, Frank Eck Baseball Stadium, Alumni Soccer Stadium, Stinson Rugby Field, Melissa Cook Softball Stadium and several other facilities at Notre Dame. To learn more about the SportsCluster Green LED system, visit the Musco Lighting site.